Johannesburg-based MAAN Creative worked with stage producer Janni Younge on a theatre piece combining puppetry, dance and animation. After a sold-out Cape Town run at Artscape and the National Arts Festival, the production, commissioned by IMG Artists, is now on a US tour. In a burgeoning and competitive local animation landscape, Johannesburg-based studio MAAN Creative are carving out an intriguing niche as animators to the live theatre world. Headed up by directors Michael Clark and Johan Scheepers, MAAN recently completed work on THE FIREBIRD, a visceral theatre experience combining puppetry, dance, and animation. 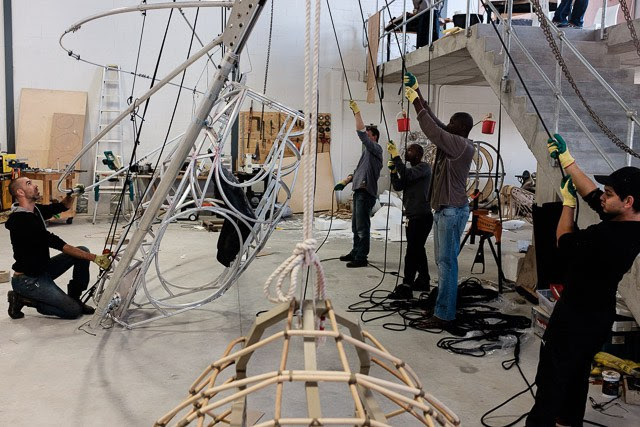 Commissioned by LA’s IMG Artists, THE FIREBIRD is the brainchild of producer Janni Younge, formerly of the famous Handspring Puppet Company - renowned for their collaborations with artist William Kentridge, as well as their work on the West End blockbuster WAR HORSE. Having opened with a brief but highly successful run at Artscape in Cape Town, followed by sold-out performances at this year’s National Arts Festival, THE FIREBIRD has now embarked on its US tour. Loosely inspired by Igor Stravinsky’s progressive 1910 ballet of the same name, THE FIREBIRD unfolds an abstract narrative drawing on South Africa’s recent history of freedom and conflict, while also evoking a deeper personal conflict between creativity and reason. Themes of restraint and subjugation warring with freedom and self-expression are conveyed simultaneously by the dancers, the otherworldly animal puppets stalking the stage, and by MAAN’s animation sequences, projected on a huge white egg suspended over the action. The ambitious sensory smorgasbord climaxes with a great dragon looming over the stage, wings outspread, breathing fire. On the US leg of the tour, a live symphony orchestra performs Stravinsky’s score. “This was a challenging, but very rewarding project which helped us realise we want to make this kind of work a focus for MAAN,” says Michael Clark, who was responsible for creating the over 70 original acrylic artworks that served as key frames for the animation. The sequences were then pieced together in Photoshop, TV Paint and After Effects. This is MAAN’s second collaboration with Younge, the first being OUROBOROUS, a production she staged as winner of The Standard Bank Young Artist for Drama in 2010.